After the apocalypse, attractive young women take off most of their clothes (but I thought they were supposed to ride Harleys, too). 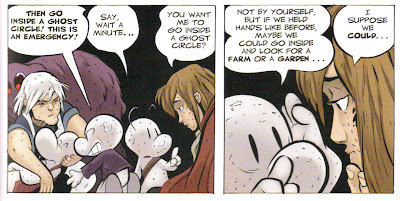 Ghost Circles , written and illustrated by Jeff Smith. Color by Steve Hamaker. Bone, volume 7. Scholastic (New York): 2008. ISBN-13: 978-0-439-70634-6. ISBN-10: 0-439-70634-3. $9.99. 150 pages. Full color. 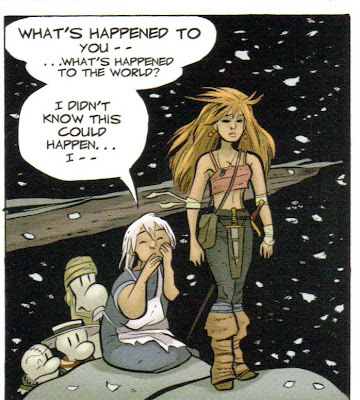 Ghost Circles is the seventh of nine volumes of Bone, the comic book epic about a little cartoon character who falls in love with a woman and helps her save the universe. This volume begins the third trilogy, Harvest, in which the atmosphere changes drastically and the humor gives way to drama as the story rushes to its climax. The book opens where Old Man's Cave left off: the rat creatures and their human allies begin the assault on the Northern Valley's only stronghold while Fone Bone and his companions rescue Thorn from the Hooded One's sacrifice. The interruption of the sacrifice causes a volcano in the Eastern Mountains to explode, laying waste the Valley and unleashing invisible pockets of the Dreaming known as Ghost Circles, which turn anyone who unwittingly enters them into an undead nightmare being. With the magical powers of her birthright at last manifesting themselves, Thorn must lead Fone Bone and the others through this wrecked landscape to find the holy city of Atheia, where they can mount a final defense against the armies of the Lord of the Locusts. 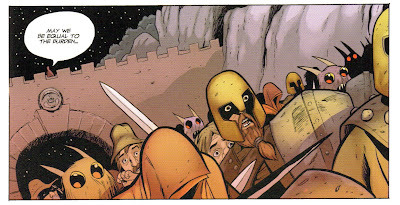 I expect that was gibberish to anyone who hasn't been reading these comics, and someone's probably TO'd that I described so much that happens so late in the story, but that's what you get for reading the plot synopsis for the seventh volume in a series, so there. Probably not the most practical outfit to wear while trudging through a volcanic ash field in late Fall. The tone of Bone changes markedly in this volume; previously, the transformation of the series from episodic humorous antics to full-scale epic was a gradual and imperceptible one, but when the mountain blows up, there's a clear break: the idyllic forest environments are gone, replaced with endless wreckage, a precursor to the urban environment that will occupy the final two volumes. And although the sense of humor isn't entirely dead, there isn't a lot to laugh at in Ghost Circles, either. The story is driven instead by well-placed action sequences and a lot of character development. Bone's relationship with Thorn, which is the heart of the series, also grows deeper and more ambiguous. I think Bone just wants to hold hands. Don't just stand there. Do something awesome! In this volume, the Bone cosmology gets more development, for while trekking through the valley and punching their way through carnivorous rat creatures, Bone and the gang have time to discuss religious matters. The mythology of Bone is (very loosely) based on the Australian Dreamtime by way of Jungian psychology with a little added flourish from India: it involves a mystical otherworld called the Dreaming, in which dwells the Lord of the Locusts, who is trying to break into the physical world by possessing a mortal. The three Bone cousins, who come from a modern society, react to the talk about the Dreaming in different ways: Smiley Bone, apparently credulous, accepts it whole-heartedly while Phoney Bone, a materialist, rejects all of it even when he is hard-pressed to explain what's going on. Fone Bone, the moderate, tries to please everybody and ends up pleasing nobody. FONE BONE: I'm afraid Phoney's right, all this Dreaming stuff is hooey. SMILEY: You didn't think it was hooey when we were up on the ridge and we thought Thorn had been KILLED. FONE BONE: What are you talking about? SMILEY: We didn't know where Thorn was... You closed your eyes and you could tell--without even SEEING HER--that she was ALIVE! In these sequences, Smith captures in a humorous way the frustrations of trying to find a compromise between incompatible belief systems without coming out and saying that one belief system or another must be wrong. Today, probably the most pernicious form of such compromising philosophy is called pluralism. Pluralism holds all religions, or at least all world religions, to be fundamentally true even though they are in blatant disagreement with each other. The pluralist achieves this religious compromise by misunderstanding and misinterpreting religions, usually by ignoring their doctrinal precepts and focusing on a watered-down version of their moral teachings. He's right, of course, but as a pluralist he cannot tolerate such exclusivism. He goes on to speculate gleefully that the doctrine of the Incarnation will be dead in about fifty years' time. So in Hick's pluralistic view, Christianity is great--as long as it isn't Christianity. To accord with Hick's pluralism, Christianity and all other religions must lose their central tenets and die, yet Hick presents pluralism as generous and all-encompassing because it supposedly respects all religions. Hick, like most pluralists, utterly distorts the religions he discusses. As he openly admits, his only real interest in religions is in their "basic ethical teachings" (p. 227, emphasis in original). Hick sweeps away all the ideas of the religions he examines and leaves only the morals that he considers basic, and you damn well better believe that a pluralist will never consider any uncomfortable or inconvenient ethical teachings to be part of the basics. Hick is not really as interested in, or as respectful of, religions as he claims to be. To him, they are merely props or excuses for his own religious system. Religious pluralism, in tune with the faddish religion of Tolerance for All, is an invitation to intellectual laxness. The great error of pluralism is an utter lack of self-awareness. Pluralists set up their own beliefs as the ultimate truth and as the real meaning behind all religions. In other words, pluralists teach pluralism as dogma--but they do not recognize it as dogma. Indeed, they go so far as to attack and criticize other religions for presenting their teachings dogmatically. The Christian, on the other hand, is self-aware: he knows that he considers all other belief systems, to a greater or lesser degree, to be false. The pluralist considers all other belief systems to be false, but claims at the same time that he holds all belief systems to be true. I daresay there is no system of religious thought more dogmatic, more exclusivistic, or more triumphalist than pluralism, yet the pluralist wastes his time attacking dogmatism, exclusivism, and triumphalsm. That is why a Christian trying to communicate with a pluralist can experience as much frustration as a beaver trying to communicate with Fone Bone: the pluralist wants to have his cake and eat it too, to champion religion in the same breath he is attacking it, and to compromise with everyone while at the same time trumpeting his own beliefs as the ultimate truth at last discovered by his overwhelming intellectual prowess. Besides its logical inconsistency, pluralism's other tragic error is in failing to recognize that "basic ethical principles" do not exist in a vacuum, but stem from the underlying theological precepts of the religions that teach them. Christianity does not teach Christians to do as they would be done by because it's nice and sentimental to do so, but because humans have inherent dignity and because God is loving and Christians must imitate him in preparation to live with him for eternity. Buddhism does not teach that Buddhists should do as they would be done by because it's nice and sentimental to do so, but because they want to be enlightened and enter Nirvana. People's behaviors are built on a bedrock of beliefs and ideas: the man who believes humans are created in God's image will struggle to treat them as though they are created in God's image, but the man who believes humans are mere animals will treat them as though they are mere animals, or if he doesn't, his intellectual descendants will. As G. K. Chesterton argues in Heretics , it is impossible to build a system of ethics on mere sentiment. Pluralism empties religions of their theology in an attempt to leave their ethics naked, but in the end, the ethics too will be lost. Any attempt to compromise two irreconcilable worldviews will result in such unforeseen loss. Because pluralism is not a coherent philosophy and never can be, the ethics it champions are based on nothing but sentiment; as a result, they must necessarily shift when sentiments shift; they can never transcend immediate circumstances or the whims of the age. They cannot stand throughout time and challenge us to do more or believe more than most of us were willing to do or believe already. They cannot inspire us to be better people. Something like this is evident in Ghost Circles, in which the central dogmatic believer in the Dreaming, Gran'ma Ben, has a defined goal toward which she works: she wishes to defeat the Lord of the Locusts and save the Valley. But Fone Bone, who wants to have it both ways, finally exclaims in a difficult moment, "Who cares about the stupid WAR? We're just trying to SURVIVE!" (p. 110). Without definite beliefs, a man can have no definite ethics. Content Advisory: Contains mild action violence.